Oily skin and sunscreen. The struggle is real. I used a lot of heavy duty anti acne products when I was a teenager which made me worry what my skin would look like by the time I was 60. This sparked my love/hate relationship with SPF. SPF is great stuff, but fraught with challenges for those who are also fighting a daily battle with ‘shiny face’. I’ve also found that there is a much smaller range of SPF’s for oily skin in the UK than there is elsewhere in the world. It’s SPF 50, so offers very high protection for your face. I’d be happy with a lower SPF as I’m not convinced of the benefits of SPF over 30 in normal UK weather, but I’m not going to complain about that. It’s got broad spectrum, photostable UVA/UVB protection so it doesn’t break down and become ineffective as soon as the sun shines. This also contains La Roche-Posay Thermal spring water which keeps skin calm and can only be a good thing if you have sensitive, problem skin. The product has no nasty parabens and is non-comedogenic so is great for sensitive or problem skin. The SPF itself is a creamy, white lotion which dries very quickly, so you need to have your wits about you when you apply it. Move fast people! Move fast and work it into your skin well and you should be able to avoid the famous white cast of doom. As this is perfume free, it does smell of chemicals because there is nothing to mask them or give this the nice ‘sun cream’ smell that you’d normally expect. By far, the best thing about this product is the finish – it dries almost completely matte which I have never seen another face sunscreen do. I use this on a completely bare face (after a few sprays of my calming toner) so it can work directly with my skin. I’ll then apply any ‘barrier’ products like my moisturiser after this has had a few minutes to work with my skin. Even though I have problems with oil, this SPF isn’t particularly hydrating so I still apply Effaclar Duo [+] to balance things out. This is normally £16.50, but is currently 25% off at Boots! 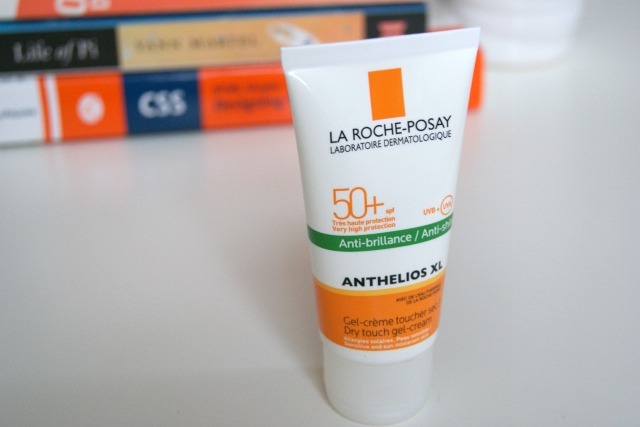 As always, I love reading your comments – do you use SPF? What’s your favourite?